Perfect for small and urban gardens, patios, and balconies, Haxnicks Patio Planters enable anyone to easily "Grow Your Own" - the kids included! Made from a range of bright and rustic colored polyethylene, all of our planters have brass drainage holes around the sides and bottom, which is essential for satisfactory results. Haxnicks is exclusively distributed in the USA by Tierra Garden, a division of TDI Brands (www.tdibrands.com). Premium range of patio planters in olive green fabric for extra durability and a smarter look. Made from top quality UV-stabilized polyester fabric with reinforced brass drainage holes and tough fabric loop handles. Perfect for small and urban gardens, patios, and balconies, our Patio Planters enable anyone to easily "Grow Your Own" - the kids included! Designed to make it easy for anyone to enjoy the taste of home-grown vegetables, fruit, salad and herbs. They are tremendous value when compared with your usual large pots, and can be folded flat for easy storage. 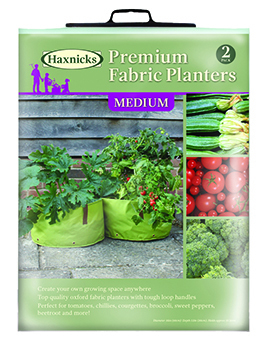 Perfect for potatoes, beans, peas, carrots, leeks, celery and more! 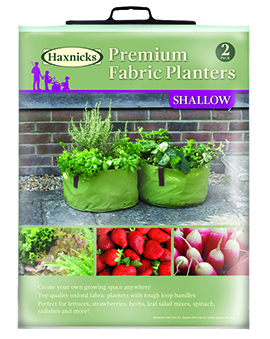 Perfect for lettuce, strawberries, herbs, spinach, radishes and more! Have kids join in on the fun! Make a garden, create a sandpit, or do both!